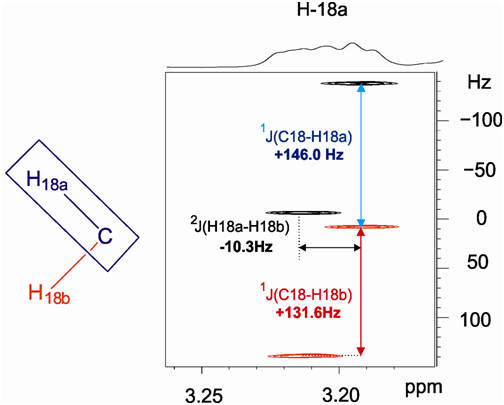 A double-selective variant of the SELINCOR pulse sequence yields 1D proton multiplets that exhibit pure absortive in-phase lineshapes for precise measurement of specific long-range proton-carbon coupling constants in small organic molecules at natural abundance. 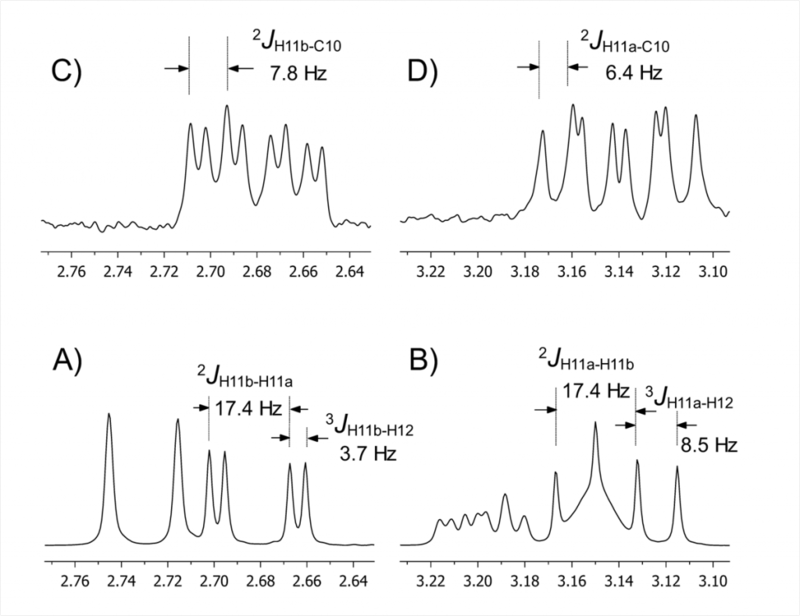 The double-selective SELINCOR pulse sequence is a carbon-selective 1D HSQC experiment developed for direct and accurate measurement of coupling constants between protons and non-protonated carbons, althought it can be used also for protonated carbons. 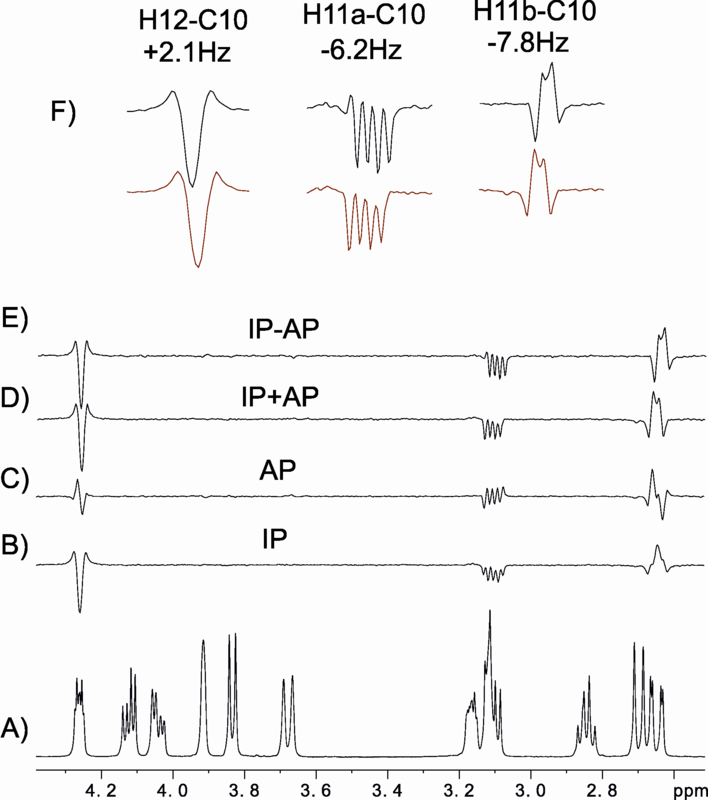 The inter-pulse delays are optimized for small coupling constants while a 90º 13C pulse before acquisition removes antiphase distortions yielding a pure absortive in-phase signal split by the proton-proton and proton-carbon coupling constant. In this way, heteronuclear couplings can be measured by peak separation or using a simple peak-fitting procedure. Expansions of (A,B) Conventional 1H-NMR spectra and (C,D) double-selective SELINCOR spectra showing proton-carbon multiplet with pure absortive in-phase lineshape for precise measurement of specific long-range proton-carbon coupling constants. Extraction of 1JCH for all carbon multiplicities. © 2011 – 2012, Sergi. All rights reserved by the author(s) and Universitat Autonoma de Barcelona except for texts and images already copyrighted by third parties (e.g. journal publishers) and used here under the fair use provision.